If the photos from Mars took your breath away, you should probably keep an oxygen mask handy. And we don't mean for space travel... yet. 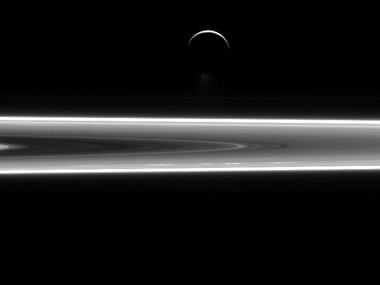 In a visually stunning release by Nasa, Enceladus the crescent moon is photographed from onboard the Cassini spacecraft, shining right above Saturn's blue rings. Assigned to explore Saturn and its moons, the spacecraft flew about 630,000 miles from the moon in July 2015 to explore the possibility of life. On analysis, the data taken by Cassini doesn't posses the ability to detect the signs of life but the sample can reveal a little bit more about our destination shifting from Mars to Enceladus. Enceladus, a luminous moon in a galaxy of stars looks like a life supporting body. Recently, reports from different research suggests that Enceladus actually has life-supporting signs of liquid water beneath its frozen sheen sphere. There is a chance that we might take a dip in that icy pool of water in the near future. Enceladus alone cannot take responsibility for adding beauty to Saturn's rings; this phenomena is created by icy plumes constantly shooting from the moon. The creates what is known as the "E ring" around the planet as Enceladus circles the world in the same orbit year after year. During the flyby, Cassini will also be snapping images of Enceladus' surface reflecting the light from Saturn, reported Wearable Technology.